MPs voted in favour of a Government-backed amendment, which proposes to replace the Irish backstop with “alternative arrangements”. The MP for Carshalton and Wallington told talkRADIO’s Mike Graham: “We [the Liberal Democrats] did win something yesterday, which was the Caroline Spelman amendment that has reinforced that Parliament won’t accept no deal. “Clearly the Government got the Brady amendment through, which is quite bizarre because what the Brady amendment does is in effect say that the Prime Minister’s deal is a bad one. 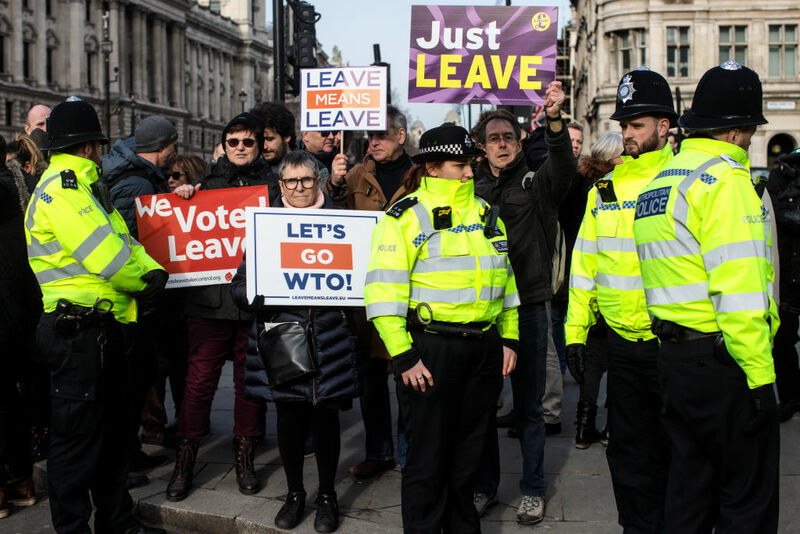 Leave Means Leave protesters outside the Houses of Parliament on Tuesday. The Brady amendment was voted through by 317 votes to 301 – a majority of 16. The only other motion that passed was Dame Caroline Spelman's amendment, which seeked to prevent the UK from leaving the EU without a deal. The amendment is not legally-binding but shows MPs are against a no-deal Brexit. It was approved by 318 votes to 310 – a majority of only eight. Mr Brake added: "The business community are getting increasingly alarmed at the prospect of no-deal."